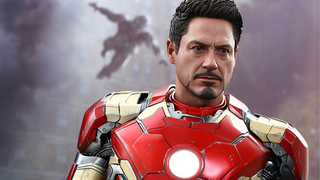 Hot Toys have put out roughly one billion Iron Man toys over the years, but this one is a little different. He's the first ever 1/4 scale Iron Man figure from the company, and thus the closest you'll get to having your very own Robert Downey Jr. so far. The 20-inch-tall, fully articulated figure is based on Tony's appearance in Age of Ultron, wearing the Mk. 43 suit. Not only does he come fully kitted out in the armour — which lights up in several places, and also has a bunch of removeable parts so you can strip it down or add extra pop-out sections for rockets and what not. What's a Tony Stark without his toys, after all? Of course, he also comes with a Helmeted head too, which also has light up eyes. It's a very large, very RDJ-shaped Lamp, basically. A fancy figure also requires a fancy base, and this Iron Man comes with the body of a smashed up Ultron sentry to pose him either standing victoriously over or about to repulsor blast the living crap out of it. You can even pull the head and arm off the poor drone, to recreate your own "Alas poor Yorick" moments between Iron Man and his robotic foes. This plus-sized Iron Man will be out at the end of the year. Sideshow Collectibles doesn't have the figure up for sale just yet, but previous 1/4-scale toys have gone for between $450-500, so expect your wallet to have a mild freakout if you plan on picking one up.